The past few weeks have been pretty crazy, for lack of a better word. The emotion from the elections, the dark realization that our country is a lot more racist, xenophobic, misoginist than I naively thought we were, and the strong desire to do something positive to help outweigh the increase of discriminatory and abusive actions that have resulted have kept my mind busy. To be honest, writing about beautiful sewing felt petty. I’ve now come to realize that sewing and creating are necessary parts of my way of sending kindness and positivity out into the world, and so I’m back to making and sharing as much as I can manage, as well as putting even more energy into fostering a giving spirit of loving kindness in my children, and doing everything else in my power to speak out for human rights and support those who are already fighting the good fight. During those first few days post-election, I had a discussion with some of my quilty friends who also felt a strong need to create a public statement of our desire to stand with those who would be most negatively affected by the increased public shows of aggression toward minorities. Karin from Leigh Laurel Studios and Samarra Khaja brought our attention to the Safety Pin Movement, a movement that originated after British citizens voted to leave the European Union in June, when the nation experienced a 57 percent rise in reported xenophobic incidents. According to a NY Times article, it began with a tweet by an American woman living in Britain suggesting that people wear safety pins to show support to those experiencing abuse, inspired by the #illridewithyou movement in Australia, in which people offered to take public transportation with Muslims fearing a backlash after a Muslim gunman held people hostage in a cafe in 2014. (NY Times) It felt like the perfect, simple, symbol that could show others that you are an ally, ready to stand with those being abused, speaking out against hate. 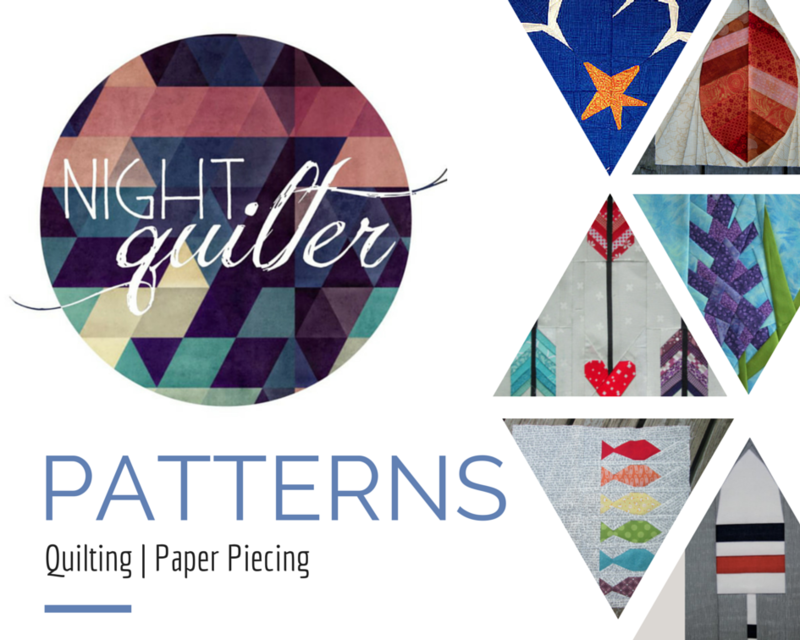 Mandy from Mandalei Quilts decided that she was going to make a large safety pin quilt to hang on her porch, and I did what I do–I created a foundation paper pieced block. Safe With Me is a simple block, offered for free on my Craftsy site. It’s a symbol to signify you are an ally (no matter who you voted for). Wearing or displaying the safety pin means: You are safe with me. I stand beside you. I created this pattern to help spread the word, and spread the love. Sewing up or even wearing a safety pin is not the end, though–be sure to use your voice. If you see or hear injustice, stand with the persecuted and provide help whenever you can. Call your governmental representatives, make your voice heard and join the fight with love (albiet fierce love). I’m grateful to Kate Basti for quickly offering and sewing up the block within hours so that I could release it into the world on a hopeful mission of good. Hers is the safety pin above, on purple. I’ve given a lot of thought to this pattern, since there is criticism that the safety pin is just a way for us to feel better about ourselves, or even that being such a widely known symbol, it could be used in nefarious ways. After much reflection and discussion with my husband, I decided that despite these criticisms, I think the safety pin symbol is a good thing. My intention was purely to try to spread some hope and goodness with a further reach than my little rural Maine town. Even if the act of wearing or sewing a safety pin doesn’t make any difference in and of itself, it is a conversation starter, keeping the conversation about the need to stand up for human rights and fight bigotry going, and will hopefully act as a personal reminder for those of us who are not in the minority to step up and use our privileged voices for good. We have a lot of work to do. I’ve selected 12 of my one-of-a-kind lady portraits (including the nine seen in this photo and at least two you haven’t seen before. They are each approx. 18″x22″ in size). All proceeds, minus actual shipping will be donated directly to the Sierra Club, the ACLU and Planned Parenthood. The auctions for each portrait will end Friday, November 25th so you’ll get ample time to watch the auctions build throughout the week and throw in any last minute tryptophan-fueled bids for great causes the day after Thanksgiving. It’s all an experiment in doing good and giving back in creative ways, so let’s all make this happen…with festive sprinkles on top! I have my eye on a few of these, and have already bid and been out-bid a few times, so head over and get into the game for a good cause (and an amazing one of a kind piece of fiber art). Rachael from Imagine Gnats has teamed up with Sam from What Sam Made to host a t-shirt fundraiser for the Black Lives Matter movement. Rachael’s post here really hit home, and talks more about the collaboration and the movement. I know that emotions are high right now and that there are many differing opinions about everything, but in my heart I know that working toward human rights and the ability for all of us to live and thrive peacefully on this beautiful earth is the right thing to do. I truly believe that love will win, and that generous loving kindness does far, far more good than harm (if it ever does actually do harm). No matter what your political affiliation, no matter your personal beliefs, I hope that we can agree that there is always room for more kindness in the world. Please be kind.